Happy Birthday Father James Brady! We're growing - pardon our progress! 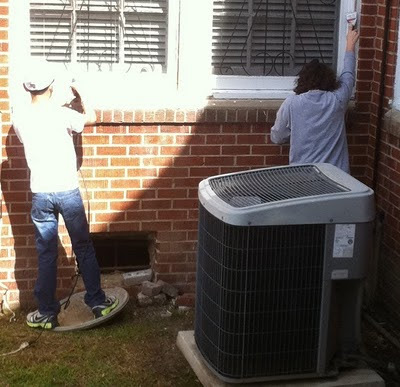 Parish Work Day - Success! 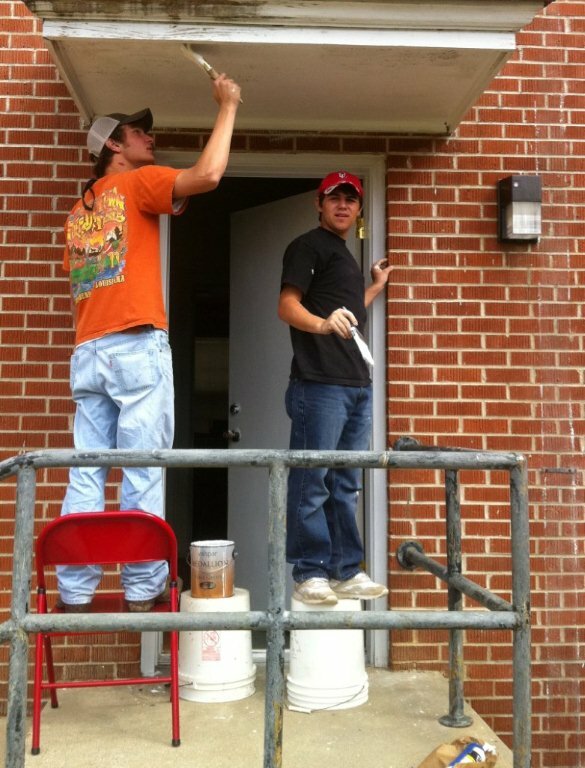 The bulletin for the week of April 03, 2011 has been posted. Click here to see it. The current week's homily is available on a link on the front page of the website next to the link for the current week's bulletin. On the page with the prior bulletins, the corresponding homily will be sitting side by side with its bulletin. We started on the anniversary of the start of the Catholic Church, Pentecost Sunday --- over a year and a half ago. This week, the Third Sunday in Lent, is our one hundredth and nineteenth! podcast to be posted. The homily is given by our pastor Father James Brady. So, take a listen and let us know what you think. Click here to download the Third Sunday in Lent homily from St. Landry Catholic Church, Opelousas, Louisiana. Our next meeting is Monday March 28, from 6:30 pm until 7:30 pm in Valentin Hall. Parents are invited to attend this informative series dealing with the issues of Morality for the Christian Family! Mrs. Jennie Stelly is the facilitator and the Junior Catholic Daughters are offering free babysitting services. Call Dwayne Joubert at 594-8408 or 308-0001 for more information as well as questions. The bulletin for the week of March 27, 2011 has been posted. Click here to see it. What's the banner about? It's the Man to Man Conference with Rudy, Father Larry Richards, and Jesse Romero. Get registered on their website! A gifted and captivating speaker, preacher and retreat master, Fr. Larry Richards holds the answer to some of life's most profound questions. He speaks from experience as a pastor of an inner city parish, a high school chaplain, a counselor and an evangelist. His inspirational talks and presentations, always authentic and enthusiastic, have changed the hearts, minds and lives of millions of listeners worldwide. Conference goers will once again hear from last year's conference favorite, Jesse Romero. Romero, a former nationally ranked kick-boxer, is well known for his powerful, moving talks on Catholic faith. Jesse is committed to keeping the Faith alive by speaking at parishes and Catholic events throughout the United States. Speaking with the energy and conviction that has become his trademark, Jesse's audiences are left with the indelible impression that our Catholic faith is something to be worn visibly and proudly. 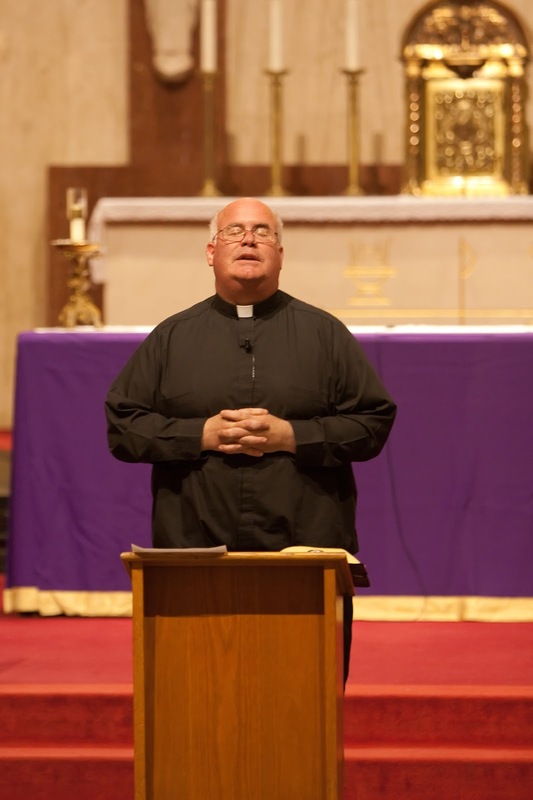 Father Broussard, born and raised in Lafayette, is a priest of the Diocese of Lafayette. 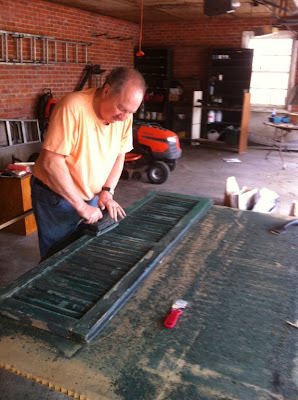 He is currently serving as Spiritual Director of the Cursillo Center in Prairie Ronde, Louisiana. 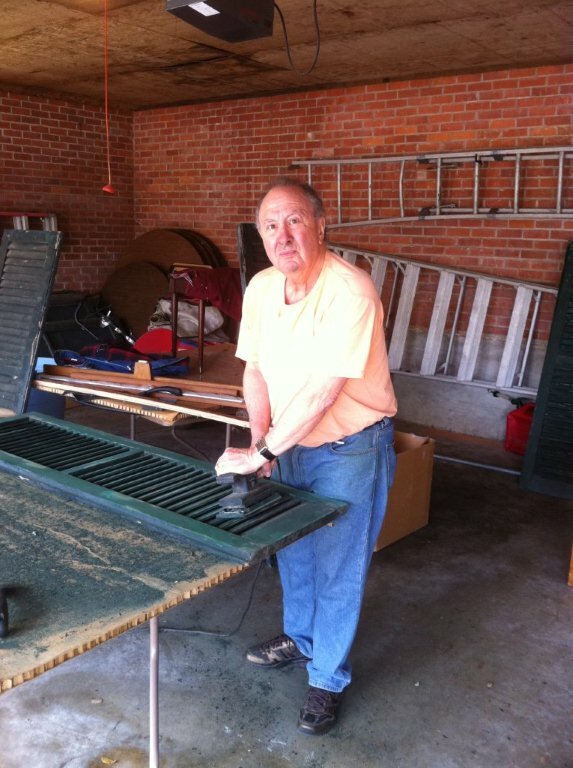 The Cursillo movement has existed in south Louisiana for over forty years. During that time, an estimated 40,000 people have attended the powerful weekend experience at Prairie Ronde. 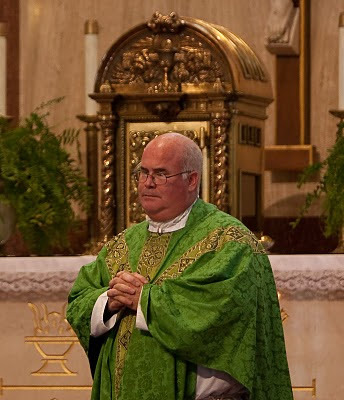 We want to wish our pastor Father James Brady a happy birthday from the whole St. Landry Catholic Church family ... and many many more birthdays! Today is our one year anniversary of going online with the St. Landry Bell. As parishioners have noticed, our bell, donated to St. Landry Catholic Church by the Catholic Daughters of the Americas Court Number 119, cast in April 1912, and installed in November 1912, is back in operation. We may remember some time ago it stopped ringing as a result of lightning striking some of the equipment. 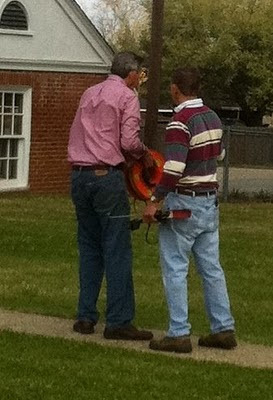 We were able to get it running on October 30, 2009 using 1960’s technology. Recently, we removed the 1960’s technology and have installed a ‘state of the art’ computer system to manage the ringing of the bell. 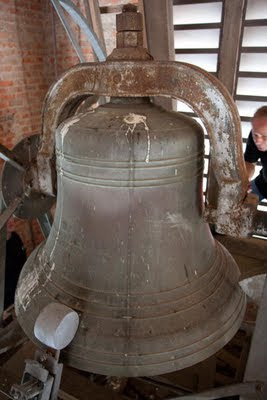 This allows us to have the one bell do several types of ringing. These are the Angelus, Call to Worship, De Profundis, Hours of the Day, and other times. I would like to update parishioners about these. Click here to read the rest and download the whole insert: The Bell Insert in PDF form. 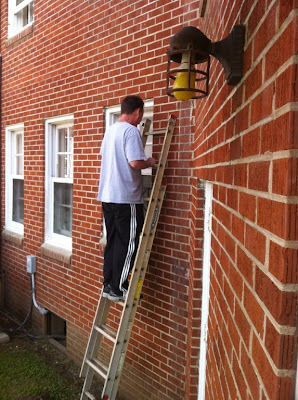 You'll find prayers related to the bell ringing, art, and details about how the bell helps us in our worship. 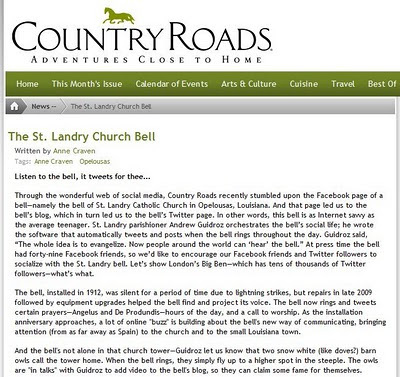 Our bell has been popular with many folks following it on Twitter and Facebook and blogs. The bell also was written about in various places last year. In Country Roads Magazine, the article can be found by clicking here. Next year, it will be 100 years that our bell has been calling parishioners to worship. In these next 100 years, our bell will continue to be heard ... not just in Opelousas, but across the reaches of the world via technology. With more parishioners becoming active in the parish, we're having to rearrange things, add more capacity, and update things. This is a wonderful thing! You're going to notice some changes with our web presence as well. With so many people using our website, joining our email lists, downloading the recordings of homilies and our Lenten Mission, we're having to update things on the internet as well. The large numbers of email notifications that we're sending out have required us to update the way we do it. So ... this will be the last of the "old style" email notifications that you will receive. Later today, you'll receive a "new style" email notification. You don't have to do anything different ... the change will happen automatically. The first email you will get will be the notification of today's homily being uploaded. You received an "old style" email this morning. You'll get what is effectively a duplicate "new style" email in a few minutes. This should be the only duplicate email you'll receive. Thanks for your patience as we work through the kinks in this growing process. And thank YOU for helping to grow St. Landry Catholic Church! The current week's homily is available on a link on the front page of the website next to the link for the current week's bulletin. On the page with the prior bulletins, the corresponding homily will be sitting side by side with its bulletin. We started on the anniversary of the start of the Catholic Church, Pentecost Sunday --- over a year and a half ago. This week, the Second Sunday in Lent, is our one hundredth and seventeenth! podcast to be posted. The homily is given by our pastor Father James Brady. So, take a listen and let us know what you think. Click here to download the Second Sunday in Lent homily from St. Landry Catholic Church, Opelousas, Louisiana. After the Way of the Cross each Friday, we gather together in Valentin Hall for soup and bread. This week, we had a little shrimp soup and shared our Lenten abstinence. Fridays during Lent are days of abstinence, so no meat should be consumed by those who have reached 14 years of age. It was another nice Friday afternoon at St. Landry Catholic Church. We had an excellent turn out for the Way of the Cross. Each Friday in Lent, the Way of the Cross starts at 5:15 PM in church. Please join us next week. 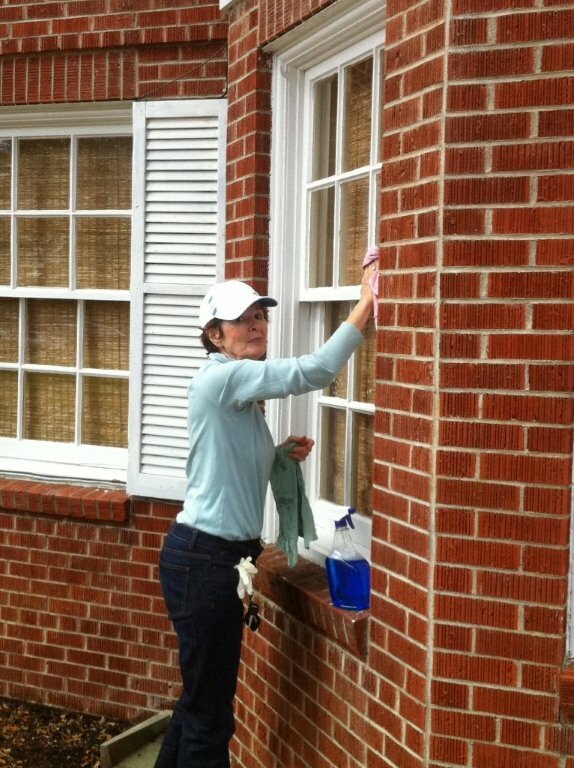 The bulletin for the week of March 20, 2011 has been posted. Click here to see it. Friends Day is scheduled for this Saturday, March 19 at the Community of Jesus Crucified, 421 ½ Carmel Dr., Lafayette. The day begins at 9:00 AM. and ends at 12 noon. See map down below for the location, on the old Holy Rosary Institute campus. Fr. James Brady, the guest speaker, will speak on the topic of “What constitutes a sacramental marriage? Everything About Annulments”. Find answers to questions about annulments: how long the process takes and why? ; Why can’t Catholic couples who are waiting an annulment enter into another relationship? How much does it cost and why does the Church grant them? Everyone is invited to attend, registration is not necessary. Contact Gloria Matte at 337-896-0524 for more info. We had a wonderful parish Lenten Mission at St. Landry Catholic Church this week. 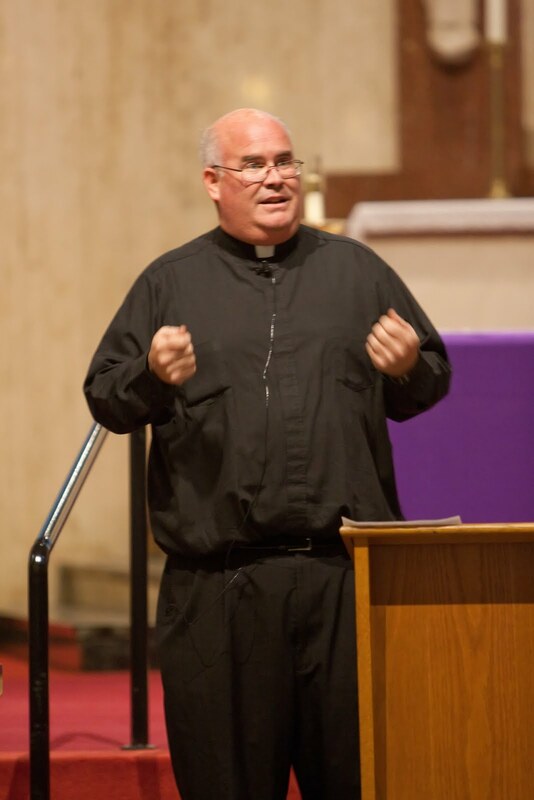 Father Brady informed, encouraged, and entertained us with his insight into the Bible and Catholic teaching. One parishioner commented, "I was touched by his humility in discussing 'Why We Suffer?'" That is a Facebook photo album. Clicking on any photo thumbnail there will expand the photo and let you flip through the photo album. You don't have to be a member of Facebook to enjoy the photos. The Lenten Mission, Night 3, is now available to download and listen to! Clicking the link should download it and automatically start it playing in whatever music player your computer is set up with. On the technical side, the file size is about 21 megs which means it may a minute or two to download on slower Internet connections. It is also an MP3 formatted file which means that these are essentially podcasts. Don't worry if all the technical words don't mean much to you. It means we're using the latest in technology in order to make sure our church parish can reach the most people. The Mission is available on a link on the front page of the website on the right hand side. 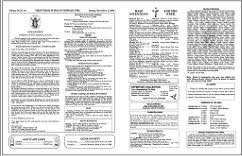 On the page with the prior bulletins, the Mission will be sitting in chronological order. We started on the anniversary of the start of the Catholic Church, Pentecost Sunday --- over a year and a half ago. This Lenten Mission, Night 3 is our one hundredth and fifteenth! podcast to be posted. The Mission is being given by our pastor Father James Brady. So, take a listen and let us know what you think. Click here to download the Lenten Mission, Night 3 from St. Landry Catholic Church, Opelousas, Louisiana. The first two nights of the mission are over! We saw a lot more new faces from the local area and from as far away as Crowley last night. It's not too late to join us ... bring a friend tonight! Father Brady waved his hands around enough last night to be named an honorary Cajun. Join us tonight at 6:30 PM for our Lenten Mission. Bring a bible with you because Father Brady will be using a lot of scriptural references. The last night of our Lenten Parish Mission will take place tonight March 16, 2011. The theme of the mission is “The Mystery of Suffering: Why Do Bad Things Happen to Good People?” The first night's audio is available on our website as well as an earlier posting on this blog. The mission night will begin 6:30 pm with Mass. The mission talk will take place after Mass beginning at about 7 pm. The talk will last 45 minutes to an hour, so the mission should be concluded by 8 pm this evening. What does it mean when we say suffering is “redeemed”? What does it mean when we “offer up” our sufferings? What is the meaning of “sacrifice” in our lives? Suffering is something we don’t talk about enough, and at times may not be prepared to endure. The mission will try to help us penetrate the mystery of suffering and help us to be more cognizant of God’s Love for us and each other in our suffering. Please mark your calendars and plan to join us! The Lenten Mission, Night 2, is now available to download and listen to! The Mission is available on a link on the front page of the website on the right hand side. On the page with the prior bulletins, the Mission will be sitting in chronological order. We started on the anniversary of the start of the Catholic Church, Pentecost Sunday --- over a year and a half ago. This Lenten Mission, Night 2 is our one hundredth and fourteenth! podcast to be posted. The Mission is being given by our pastor Father James Brady. So, take a listen and let us know what you think. Click here to download the Lenten Mission, Night 2 from St. Landry Catholic Church, Opelousas, Louisiana. The Vatican has created a new Facebook page dedicated to Pope John Paul II in time for his beatification. 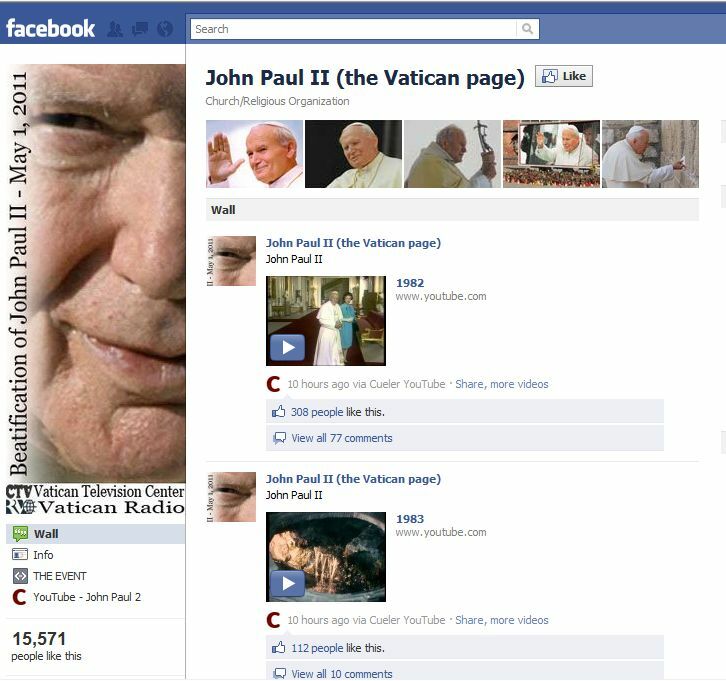 It contains links to videos, documentaries, and audio recordings from every year of Pope John Paul II's pontificate. His beatification will happen in Rome on May 1, 2011. The first night's mission was a great success! A few hundred folks came in and enjoyed a wonderful walk through the bible, from Genesis through Job, to better understand the Fall, the Promise of Deuteronomy, and why good people suffer. It was good to see Father Brady out of the pulpit and animated! The remaining nights of our Lenten Parish Mission will take place tonight March 15, and tomorrow March 16, 2011. The theme of the mission is “The Mystery of Suffering: Why Do Bad Things Happen to Good People?” The first night's audio is available on our website as well as an earlier posting on this blog. The mission nights will begin 6:30 pm with Mass. The mission talk will take place after Mass beginning at about 7 pm. Each talk will last 45 minutes to an hour, so the mission should be concluded by 8 pm each evening. The Lenten Mission, Night 1, is now available to download and listen to! On the technical side, the file size is about 18 megs which means it may a minute or two to download on slower Internet connections. It is also an MP3 formatted file which means that these are essentially podcasts. Don't worry if all the technical words don't mean much to you. It means we're using the latest in technology in order to make sure our church parish can reach the most people. The Mission is available on a link on the front page of the website on the right hand side. On the page with the prior bulletins, the Mission will be sitting in chronological order. We started on the anniversary of the start of the Catholic Church, Pentecost Sunday --- over a year and a half ago. This Lenten Mission, Night 1 is our one hundredth and thirteenth! podcast to be posted. The Mission is being given by our pastor Father James Brady. So, take a listen and let us know what you think. Click here to download the Lenten Mission, Night 1 from St. Landry Catholic Church, Opelousas, Louisiana. Lenten Mission - Starts Tonight 6:30 PM, Monday March 14! The mission nights will begin 6:30 pm, Monday, Tuesday, and Wednesday, with Mass. The mission talk will take place after Mass beginning at about 7 pm. Each talk will last 45 minutes to an hour, so the mission should be concluded by 8 pm each evening. The current week's homily is available on a link on the front page of the website next to the link for the current week's bulletin. On the page with the prior bulletins, the corresponding homily will be sitting side by side with its bulletin. We started on the anniversary of the start of the Catholic Church, Pentecost Sunday --- over a year and a half ago. This week, the First Sunday in Lent, is our one hundredth and twelfth! podcast to be posted. The homily is given by our pastor Father James Brady. So, take a listen and let us know what you think. Click here to download the First Sunday in Lent homily from St. Landry Catholic Church, Opelousas, Louisiana. 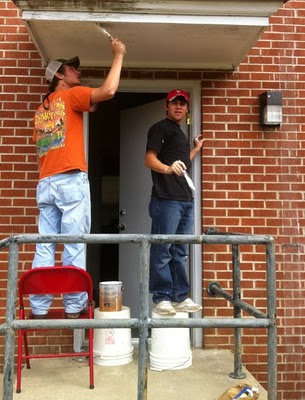 We had a great turnout for 8 AM Mass at Valentin Hall followed by a parish work day. 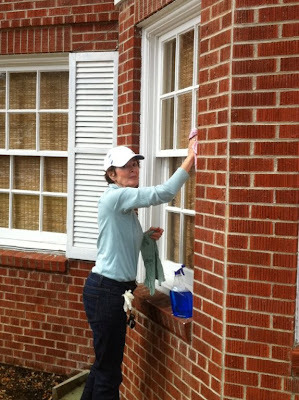 Lots of sanding and scraping of shutters and window frames, painting of hand rails, cleaning of windows, cleaning of pews ... with a big church, there are plenty of things to do. We had plenty of parishioners as well as a large group of young people from Opelousas Catholic School. Afterwards, pizza and cold drinks were welcome. Congratulations to Deacon Candidate Dwayne Joubert!! Deacon Candidate Joubert takes another step towards ordination today when he will be officially installed as a Lector by Bishop Jarrell in Lafayette at Immaculata Chapel at 10 AM this morning. We congratulate him on this step forward in his formation, and thank him for his continued response to answer God’s call in formation. Please continue to pray for him, and we look forward to his serving our parish as an ordained deacon next year! Dwayne as admitted to candidacy for ordination to the diaconate for the Diocese of Lafayette on Saturday, August 8, 2009 at St. Genevieve Church. 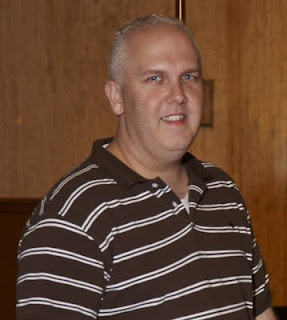 All parishioners are asked to keep Dwayne in their prayers as he advances toward his Diaconate Ordination. The mission will be presented by Fr. Brady and will be introduced at the Masses on Saturday, March 12 at 4 PM and on Sunday 13 at 8 AM, 10 AM, and 5 PM. The mission nights will begin 6:30 pm, Monday, Tuesday, and Wednesday, with Mass. The mission talk will take place after Mass beginning at about 7 pm. Each talk will last 45 minutes to an hour, so the mission should be concluded by 8 pm each evening. Please join us for The Way of the Cross at St. Landry Catholic Church starting TODAY and each Friday at 5:15 PM. Afterward, join us in Valentin Hall for a Lenten dinner. The meal will consist of homemade soup and bread. This is an opportunity for us to live our Lenten disciplines as a parish and at the same time share our faith over a meal. Look forward to seeing you there! We will have several parish work days to help restore and maintain our grounds during Lent. The first work day is Saturday, March 12 TOMORROW beginning with 8:00 AM Mass in Valentin Hall and followed by work until about midday, when we will stop and have lunch together. If you have extension cords and/or electric sanders, please bring them. 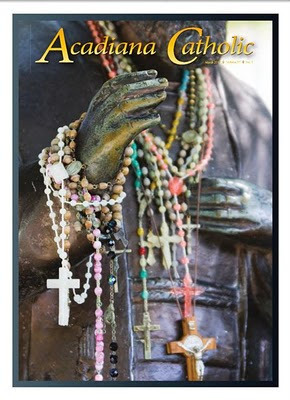 Since 1884, proceeds from the Black and Indian Missions Collection (BIM) are distributed as grants to dioceses supporting and strengthening evangelization programs, which would otherwise be in danger of disappearing among the Black, American Indian, Eskimo, and Aleute communities of the United States. 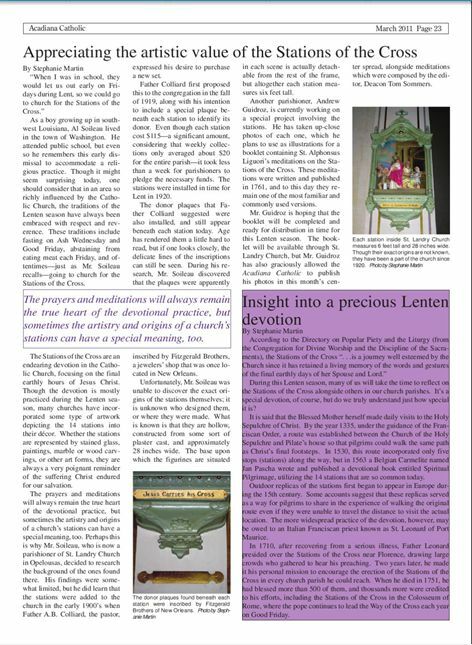 The BIM collection is taken up in most parishes on the first weekend in Lent ... as it will at St. Landry Catholic Church. For more information please write: The Commission for the Catholic Missions Among the Colored People and the Indians, 2021 H Street, NW Washington, DC 20006-4207. 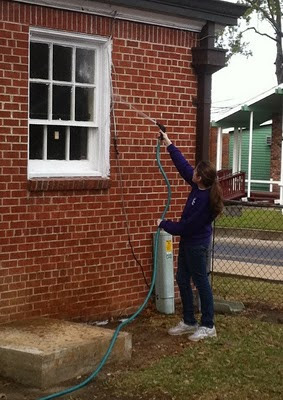 Visit http://www.blackandindianmission.org/ or call (202) 331-8542 for more information. 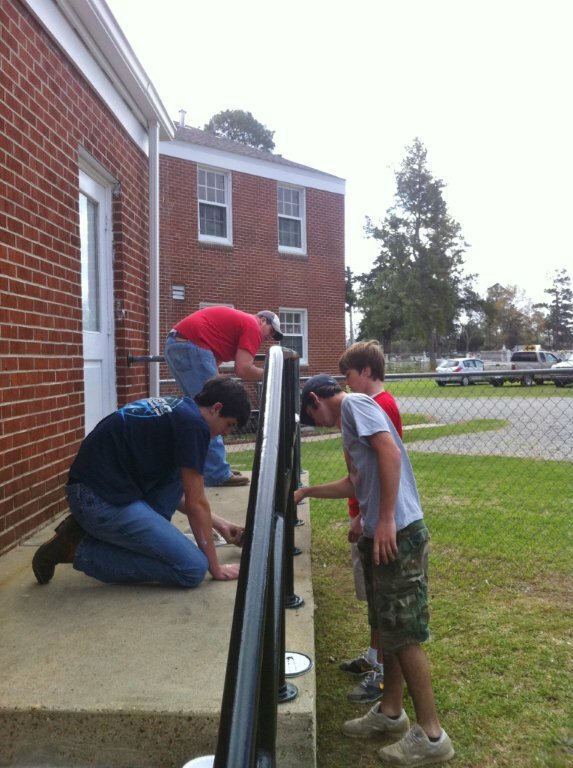 The bulletin for the week of March 13, 2011 has been posted. Click here to see it. Today is Ash Wednesday, the first day of Lent. Masses are at 8:40 AM (All School), 12:05 PM, and 5:30 PM all in St. Landry Catholic Church. The website XT3 is a website that links Catholics who participate in World Youth Day events all over the world. 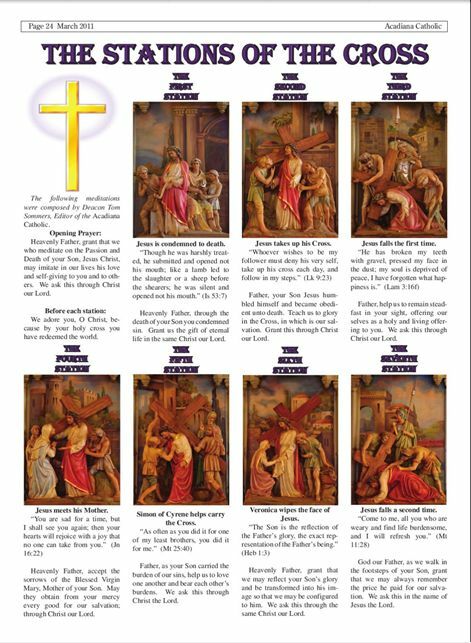 This year, they've added a Lenten Calendar that is updated on a daily basis. See it at http://xt3.com/lent and add it to your list of favorites on your computer. Lent is the period of fasting leading up to the period of Easter, recalling Jesus' 40-day fast in the wilderness. Ash Wednesday signifies the start of Lent and on this day, ashes are blessed, mixed with either holy oil or water, and marked on the head with the sign of the cross, or sprinkled on the forehead. The ashes are made from burnt palm branches blessed the previous year on Palm Sunday. When the priest imposes the ashes he says either "remember man you are dust, and to dust you will return" (see Genesis 3:19), or "turn away from sin and be faithful to the Gospel" (Mark 1:15). The ashes serve a dual purpose. First, we are reminded of our mortality and humanity as we begin the Lenten Fast. Second, the ashes are a Biblical symbol of repentance, sorrow, and humility. There are many cases in the Scriptures of wearing ashes as a sign of penitence. Fasting: The Western Rite of the Catholic Church requires its members age 18 to 59 to fast on Ash Wednesday and Good Friday, unless a physical condition prevents otherwise. This means only one full meal is permitted. The Fridays of Lent are days of required abstinence, meaning meat, and soups or gravies made of meat, are not permitted. Abstinence is required of those age 14 and older. Some give up things they have an inordinate desire for, e.g. sweets, caffeine, etc. By giving these up, the person learns to control a particular part of his or her life, which leads to greater self-discipline even when Lent is over. As such in Lent we are able to learn, examine, and get under control our material excesses. Whatever you decide to fast from, remember "Lent is more than a diet." Lent is about spiritual results, not material ones. So, while losing a few pounds may be a nice side benefit, all fasting should be done for God's glory and spiritual growth. The current week's homily is available on a link on the front page of the website next to the link for the current week's bulletin. On the page with the prior bulletins, the corresponding homily will be sitting side by side with its bulletin. We started on the anniversary of the start of the Catholic Church, Pentecost Sunday --- over a year and a half ago. This week, the Ninth Sunday in Ordinary Time, is our one hundredth and eleventh! podcast to be posted. The homily is given by our pastor Father James Brady. So, take a listen and let us know what you think. Click here to download the Ninth Sunday in Ordinary Time homily from St. Landry Catholic Church, Opelousas, Louisiana. 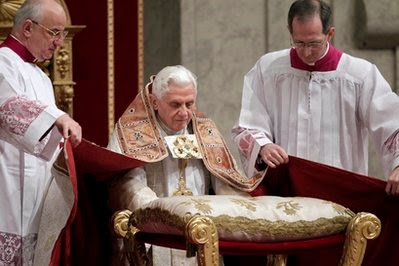 The bulletin for the week of March 06, 2011 has been posted. Click here to see it. The Acadiana Catholic, magazine for our Diocese of Lafayette, has an article this month on the Way of the Cross. 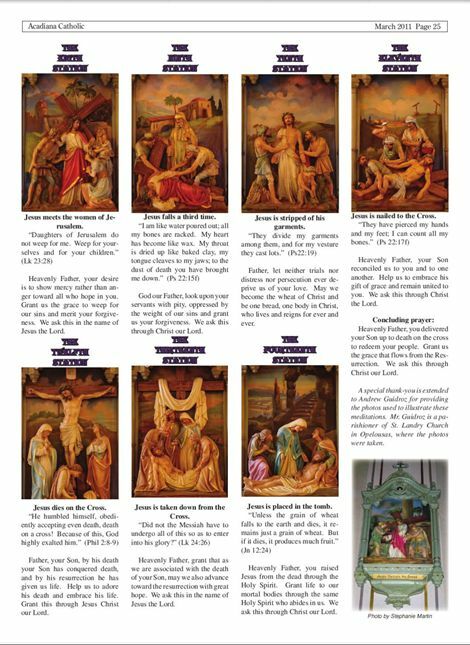 The article features photos of the stations of the cross from our own St. Landry Catholic Church. The writer interviews Al Soileau about the history of the stations. You can subscribe to the Acadiana Catholic or pick up a free copy at Crossroads Bookstore in Lafayette. Or you can see the article online by clicking here. 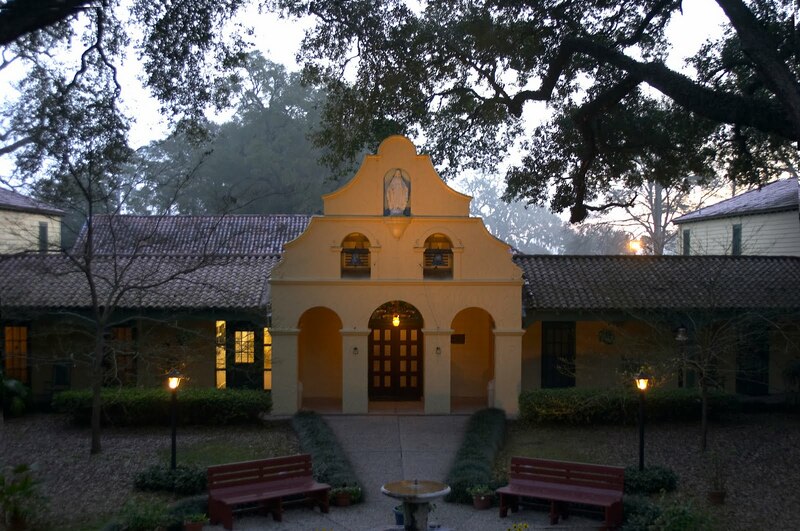 Each year, a group of men from our parish as well as other neighboring parishes attend a retreat at Our Lady of the Oaks Retreat House in Grand Coteau, Louisiana. The retreat is on the first weekend of the month of March each year. This year, it runs from this Thursday, March 3 to Sunday, March 6. We arrive at the retreat house on Thursday evening and the retreat runs until lunch time Sunday. The retreat is an Ignatian retreat given by the Jesuits there. You can contact me, Andrew Guidroz, by phone at 337 351 0732. Or you can email me through the church office by clicking here. If you are interested or know someone who is, please contact me as soon as possible in the next 2 days. We have a few rooms still available. General Intention: That the nations of Latin America may walk in fidelity to the Gospel and progress in justice and peace. Missionary Intention: That the Holy Spirit may give light and strength to those in many regions of the world who are persecuted and discriminated against because of the Gospel.